Just found these photos in my computer from the indoor swim park. We went the end of September. I only took a few photos because it was hard to get enough light and I wanted to spend time swimming and playing with the kids instead of protecting and using the camera. Rebekah loved the lazy river. We made her wear a life jacket (mostly to keep her from freezing) and she would sit on the edge with her feet in the water. She wanted to go around and around for hours. I seriously think she spent four or five HOURS in the lazy river during the day. 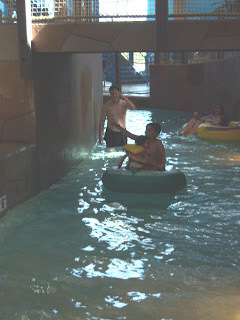 I happened to grab the photo when everyone was in the lazy river. There were also slides, a hot tub (yea!! ), basketball, obstacle course and a kiddie section with a tiny slide. Here Sean is following behind Andrew & Rebekah to make sure she doesn't try to jump ship. 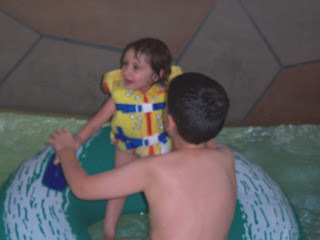 This was early in the day before we realized her love and devotion to the lazy river. Nathan is following in what looks like 'stealth mode' but is really how he can touch the bottom with his feet. I got to take a few laps with him in a double tube. We had a lot of fun. Andrew is taking a spin with Rebekah. The second photo is waving (not 'talk to the hand'). Since it was early, she was a little hesitant to let go. 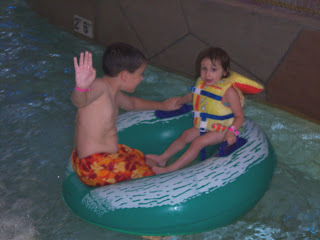 Eventually, she became princess of the lazy river waving at all her subjects. I didn't get the camera for it, but Nathan was the first to attempt the obstacle course. He worked at it for at least 10 minutes trying to get across. 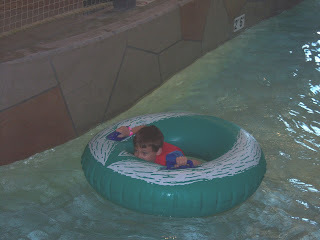 He wanted to do it himself and managed the first time with almost no help from a nervous mom. The second time, I had to stay against the side of the pool and not help at all. Andrew came over to see Nathan crossing and started doing it himself, too. I had to leave because it was too nerve-wracking for me. I would not be able to watch if they were on a show like Fear Factor. This was the last item from our Summer 08 checklist. We did everything but dig fossils (that will be back on next summer's list) and the children's museum (will be twice on the Fall/Winter list). I'm working on a Fall/Winter chart to take us through spring. I was amazed that we were able to check of 20 out of 22 items. I knew it would help us prioritize some of the things we wanted to do, but it really gave us purpose in going and doing things and having fun as a family.